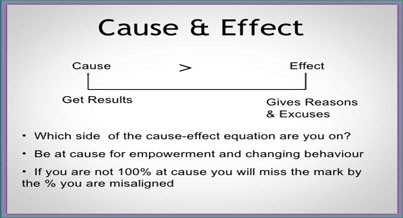 on February 17, 2017 February 17, 2017 by caroladminLeave a Comment on Are You A Cause of Effect-Type Person? Do you ever have the feeling that the world is against you? Does it sometimes feel as though everything that can go wrong, does go wrong? And then you get those moments when everything falls into place and you feel that all is good in your world again. The British Liberal Politician Herbert Samuel said “The world is like a mirror; frown at it and it frowns at you. Smile and it smiles too.” In other words, We project onto the world what is going on inside our heads. It follows then, that if we can change what’s going on inside our heads, we an change our world; that is, our experience of the world and how we feel about it. Every effect has an underlying cause. The same is true in our everyday lives. If you find your clothes don’t fit anymore, the cause may be that you have been eating too many cakes! Or if you keep being fired from jobs, the cause may be that you are a poor time-keeper. When you realise what the cause is, you can do something about it. Sometimes the cause may be something outside of our control. For instance, you may have been laid-off from your job because the company is down-sizing or moving to a different location. But you still have a choice as to whether you stay in the ‘effect’ zone where things just happen to you, or whether you step up to the ’cause’ zone and make things happen. Whatever the underlying cause for you losing your job you have the opportunity to turn it into something better. Maybe its time to learn a new skill or to look in a different direction, for instance. Increasingly we live in a blame culture where everything that goes wrong is someone else’s fault. People trip over and sue the council because the pavement was uneven. A child falls off a swing and the parents blame the park attendant for the quality of the swing. We live our lives ‘at cause’ or ‘at effect’. People who are ‘at cause’ tend to take responsibility for their lives; they don’t make excuses but look for lessons to learn in every situation and opportunities to develop, improve and expand. In truth, we all move from one to the other, but once you accept the premise that you are responsible for your own life, your awareness starts to grow and you are able to move from being ‘at effect’ to being ‘at cause’ for more of the time. In order to help yourself move from being ‘at effect’ to being ‘at cause’, consider your thoughts, words and behaviours, and those of people around you. What did I do to cause that conflict? What can I do to put things right? What can I do to change the way I feel? How can I get to being ‘at cause’ in this situation? Is there something I can learn from this? What good can come out of it? What will I do now to turns things around? Successful people live their lives ‘at cause’. They take responsibility for what happens, learn from every situation and approach life from the perspective that everything that happens is an opportunity. If you want it to happen, make it happen!